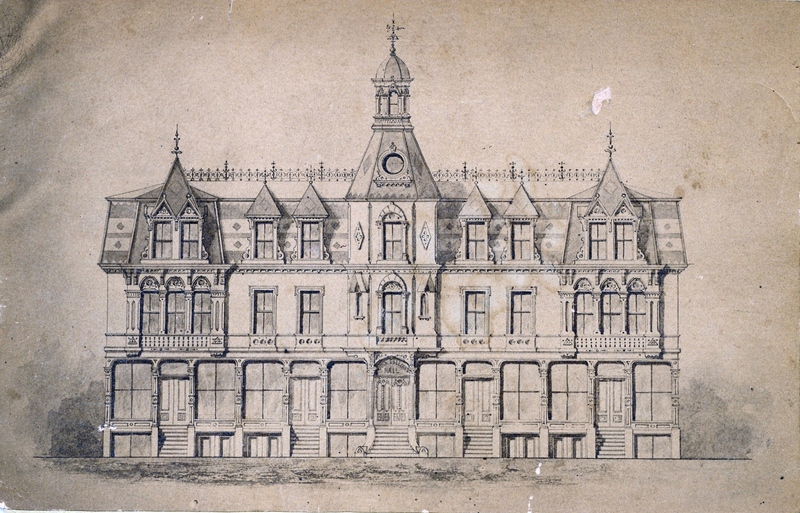 “The penetrating whistle of the Boston train arriving at midnight on Friday of last week, gave [the alarm] to the people of Needham that its principal and most ornate business block, Odd Fellows Building, was in flames. …Although the fire had evidently just but started, and people were soon on the spot, the flames increased with such wonderful rapidity that not a scrap could be taken from any part of the building. Its origin was in the basement, and…a dense smoke arose like some black demon of night.” (The Needham Chronicle, May 21, 1887). The Odd Fellows Building was built in 1874, the third business block in Needham’s new town center. 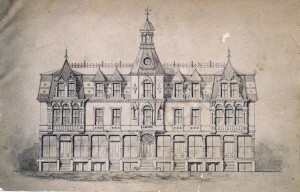 For nearly two centuries, Needham’s center was at the intersection of Nehoiden Street and Central Avenue, near the main coach roads. Once the railroad was built in 1853, crossing the sparsely-occupied Great Plain, businesses and homes were increasingly drawn to the vicinity of the Center Station. The first business block in the new center was Village Hall, a modest two-story structure built in 1854, right beside the station. It featured a general store and post office, with an assembly room on the second floor. 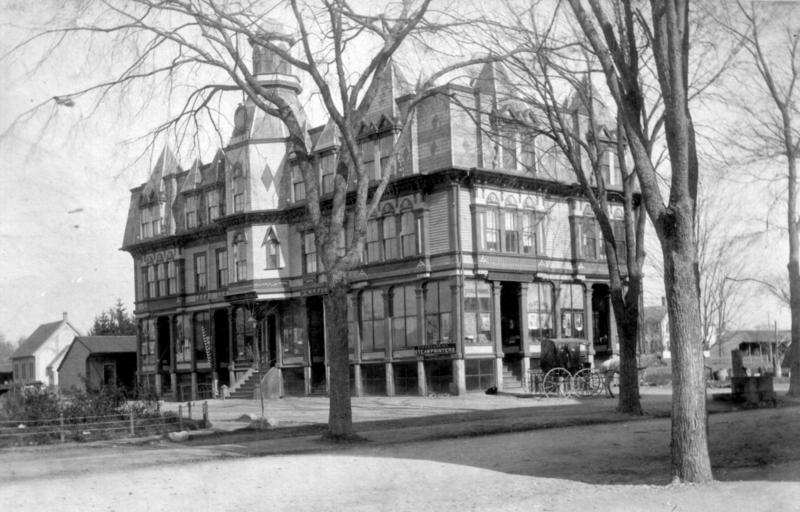 The second, the Moseley Building (1874), was significantly larger, with retail space for several stores, as well as two upper stories of meeting rooms and office space. It occupied the entire SW corner of Great Plain Avenue at Chestnut Street. Neither building could compare to the magnificent Odd Fellows Block, across the street on the NW corner. There were three full floors for offices and retail, and a fourth floor used for the meetings and records of the Odd Fellows Lodge itself, as well as for several other service or fraternal organizations. Apart from its size, the Odd Fellows Building was by far the most ornate building Needham had yet seen, with large decorative windows, an excess of pilasters and moldings, peaked dormers, a multi-hued slate mosaic roof, and a central turret with a glass cupola. A view of the ruins from a neighboring roof. The roads are the intersection of Great Plain Avenue and Chapel Street (foreground, left) and Chestnut Street (background). The bandstand platform is on the Common. 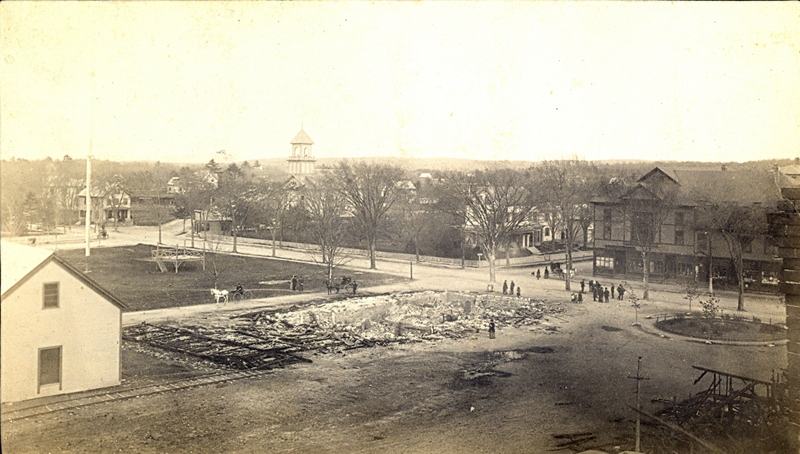 The white building at left is the current 95 Chapel Street, and the blackened timbers in the lower right corner are the remains of the original wooden Center Station. “…The Firemen, who manned hand pumps with a firemanship which must always remain noteworthy, saved the Moseley Building, where the heat was so intense that store windows cracked and bananas inside sizzled and roasted.” (Chronicle). In the 1880s, bananas were a new – and expensive – delicacy in the market. The fire site smoldered for over a week. Finally, the rubble was pushed into the cellar hole, and a fence was erected around it. Amazingly, the site remained in that state for nearly thirty years, a familiar local sight, before The Crest’s storefront was built in 1916. It was quickly determined that the fire was caused by arson. The Town offered a reward, but the culprit was never identified and the reward never claimed. None of the business owners were suspected – all, including the building’s owners, were underinsured and lost far more than they would have gained. Merchants lost their stock, tools and ledgers; lodges lost their precious records and memorabilia. A few were able to start up again in other locations in town, but many were not. Dentist Edmund Leach, foreground, surveys the still-smoking rubble of the fire that claimed his office and equipment. 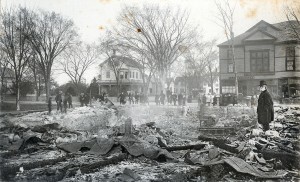 Behind Dr Leach is the Moseley Building and Crossman’s General Store; heat from the fire shattered the glass in the stores’ windows. 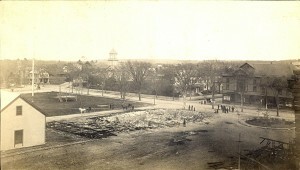 The white house (center) is now the site of Harvey’s Hardware, and the strip of grass visible at the left margin is the Common. Messrs. Bowers and Brown also expressed their gratitude to the publisher of the Chronicle, who let them use his presses so they could publish their one and only issue – a report on the fire that put them out of business.